Bonobos range over the area between the Congo-Lualaba River and the Kasai-Sankuru River in the Democratic Republic of the Congo (DRC; Kano 1984). Kano et al. 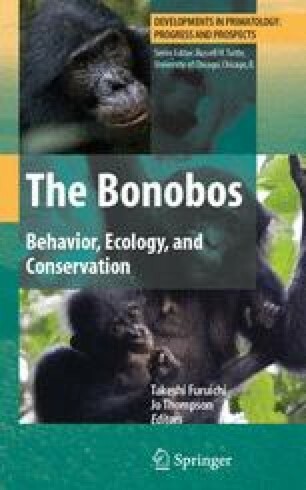 (1996) stated that bonobos are more or less continuously distributed throughout the northern part of their range, which is covered by tropical rain forest, and are distributed fragmentarily in the southern part, where the vegetation is a mosaic of forest and grassland. Kano (1992) estimated that the population of bonobos in the whole of the DRC to be ca. 50,000 in 1973. The number has decreased after several wars; however, the current population size is unknown.